Lovely double wood anemone developing a blue centre after a few days. 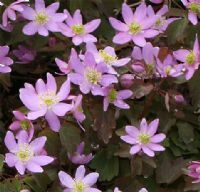 Good dark form of this lovely Anemonella which flowers in early spring. Easily grown arisaema with very long tail. 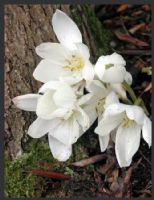 Very unusual nearly black velvet flowers with the unpleasant side effect of wafting out pulses of the stench of rotten meat. 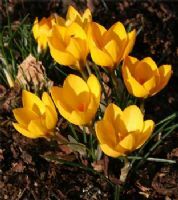 Will survive in a dry sunny spot in warmer gardens or a place in a cold greenhouse. 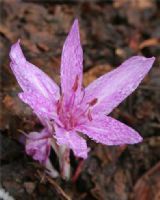 An easily grown double pinkcolchicum flowering in the autumn. 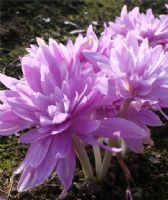 Large autumn flowering colchicum. Flowers in September without leaves. The leaves appear in the spring. This Corydalis form mats of lime green leaves with delicate pink flowers appearing in May. 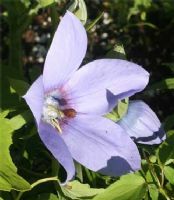 Various shades of purple flowers with brown bracts. 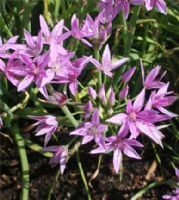 Easily grown in most garden positions. 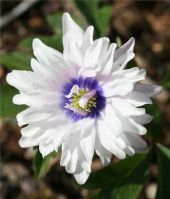 Unusual cream and brown flowers over attractive foliage. Early spring flowering. An early selection of Janis Ruksan's that is a good red colour and has a short squat sature. Deep Lilac flowers. Feb/ March flowering. Will seed about. A lovely selection of Corydalis with bright blue flowers and bronze foliage. Selected by Ruksans this Corydalis does well in the open border gradually bulking up. 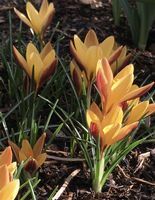 True clean stock of this February flowering crocus are hard to find.